STEM stands for Science, Technology, Engineering, Mathematics, a term introduced by the National Science Foundation about 20 years ago to consolidate the groups concerned with technical education and literacy. (4) However, the term is usually used now for technology and computer (IT) education, not for biology, medicine, chemistry, or any basic science. Around 10 years ago, the US government became worried that there would not be enough STEM workers to keep the US as a market leader in technology. In a 2007 report (1), “Rising above the Gathering Storm: Energizing and Employing American for a Brighter Economic Future,” the National Academies decried the state of science education in the USA, predicted the continued decline of science education in the public schools would result in an inability for the USA to compete internationally, and suggested steps to be taken to improve STEM education. This report was followed by another in 2010 (11), Rising Above the Gathering Storm: Rapidly Approaching Category 5,” which examined whether progress had been made- and pronounced that the public school system had not been improving in mathematics or science, that test scores had fallen for US students compared with students of other countries, and that the outlook for America to compete for quality jobs had therefore gotten worse. The US military was also concerned that it would be hurt by a lack of workers with STEM degrees. The Department of Defense is one of the US’s largest employers of STEM workers, with more than 100,000 members considered to be scientists or engineers. “We’re in the bullets, bombs, and guns business, but that’s just a piece of what the big mission is,” says Laura Adolfie, head of STEM Development at the Department of Defense’s office of the assistant secretary of defense for research and engineering (8). The military feels that it is harder for them to recruit STEM workers, as the private sector pays more. News that the US needed to improve student STEM skills became the subject of many editorials, curricula, and investments. Parents and school districts became convinced that the key to success for students - especially for girls (6) - was better STEM programs. Everyone wanted an emphasis on STEM. However, STEM programs cost money (states have lost a great deal of education funding), and many districts and schools did not have the funds or community resources to establish the programs. Scientists were welcomed into schools, setting up volunteer science programs and writing STEM grants for teachers. Corporations, including military contractors, established science programs, and wrote and sold curricula. Charter schools stressed their STEM strengths when establishing new schools. Community goodwill and tacit acceptance of the military’s involvement in education. According to Dr. John Parmentola, the Army’s director for Research and Laboratory Management, one of the primary goals of STEM educational outreach is “to give something of value back to the families across America who have given their sons and daughters in defense of the nation.” Also, one of the aims of the Army STEM Experience, a mobile science classroom manned by Army recruiters, is to give soldiers a foot in the door at “hard-to-penetrate” high schools. There are dozens and dozens of programs sponsored by the military that are available for high school students and even middle school students. The Department of Defense runs programs, and each branch of the military is involved in its own STEM programs. There are science add-on programs, summer programs, programs in schools and programs that bring students to military bases, programs that target young women, students of color, or low income youth. FIRST Lego League (FLL), a partnership between the nonprofit and the iconic manufacturer of plastic blocks, is geared towards students in grades 4-8. With help from adult coaches, students use Lego Mindstorms technologies to build robots. Different teams of students can enter their robots in regional competitions. The Air Force Research Laboratory has been the “lead organization” for the Ohio FLL since 2001, and the base is involved “from A-Z every year” with the Ohio State Championship, according to an article in Skywriter, the newspaper for Wright-Patterson Air Force Base. Coast Guard. Learning how STEM can help in a career choice is the goal of the program that brought brought homeschooled, public school, and Christian academy high school students to its Portsmouth, NH base. The students went on a cutter, and were shown a helicopter. eCybermission A web-based STEM competition for students in grades 6-9. Students can seek help on their projects from “cyberguides,” around half of whom are military personnel. Can be combined with other militarized STEM programs. For example, STARBASE 2.0 consists of student graduates of STARBASE who attend after-school eCybermission clubs. Military charter schools are another way the military offers the promise of STEM success to students. Charter schools, for profit and non-profit, are controversial, as they offer alternatives to public school, but use district money and can be selective. There are currently 18 (x) military charter schools in the USA, which advertise discipline and focus as their main attributes. Generally, these are placed in low income areas. To sweeten the offer, military charter schools are emphasizing their STEM courses as an added draw for families. One example is the Dayton Regional STEM School, which is sponsored by the Air Force Research Laboratory (AFRL). (Based at nearby Wright-Patterson Air Force Base, AFRL is known for its “pioneering” research on drones.) Students at the Dayton Regional STEM School may take courses taught entirely by Air Force personnel and have engaged in projects involving drone technology. Some private military academies also emphasize STEM. The number of jobs in IT has increased, but not as much as the number of STEM trainees. Furthermore, U.S. students are deemed not good enough, with the IT industry depending greatly on guest workers willing to work in worse conditions for lower wages. (2). It suits businesses and the military to have as many STEM graduates as possible to choose from- but this is not necessarily in the best interests of the students. Furthermore, the military focus on technology over other sciences (3) narrows the potential of students to discover an interest in, for example, the natural sciences. Many districts are now calling for the implementation of STEAM (Science, Technology, Engineering, Arts, and Mathematics) rather than STEM programs, as the integration of writing and other arts improves understanding of the sciences (http://www.steamedu.com). The quality and training of the teachers used by the military is not defined, as the military does not participate in the same discussions as do most teachers and STEM educators (10). Even when the military relies on packaged STEM curricula from other providers, teachers are not necessarily qualified as K-12 teachers. For some families, the exposure to the military and the military’s technological response to conflict is distressing, as there is tacit acceptance of war. 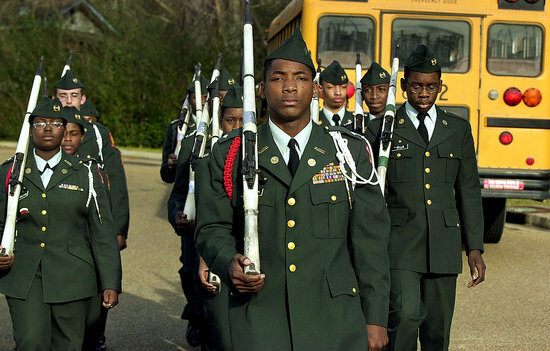 The main successes there have been are community efforts to prevent the establishment of military charter schools. For example, in 2014, activists in Bethlehem, Pennsylvania succeeded in preventing the establishment of the Advanced Military Aerospace Science Academy, a charter school that would have had all students enrolled in both STEM courses as well as Air Force JROTC. In Atlanta, the U.S. Marine Corps wanted to set up the Dekalb Marine Corps Institute, a charter school that would stress STEM skills while mandating participation in the JROTC. Months of organizing by activists with the Georgia Peace and Justice Coalition, the American Friends Service Committee and others stimulated enough opposition to the campaign that the proposal was abandoned. In their public messages, organizers questioned the diversion of funds from a popular arts-based charter school (which had been recently decommissioned) towards the Marine Corps Institute. It is very difficult to stop a STEM educational program from coming into your community. Here are a few tips for would-be activists, concerned parents, and students. Emphasize control of access to students. For example, ask that each military person who has access to children is screened in the same way as all personnel in schools are. Push for STEM classes that the military is less likely to offer, such as anatomy, botany, astronomy, bird identification. Push for STEM that is not connected to war. Write for grants to organizations that can fund STEM, so the military camps don’t have to be used. Military add-ons tend to come and go. Push for a local controlled, sustainable program. Other forms of protest are unique to the type of STEM educational program that you are targeting. For example, you can find out which schools in your area will be targeted by the Army STEM Experience, and contact school officials requesting that they cancel the visit. Activists can also demand equal access and demonstrate on the date of a van’s visit. (1) “Rising above the Gathering Storm: Energizing and Employing American for a Brighter Economic Future,” 2007. By Members of the 2005 “Rising Above the Gathering Storm” Committee, National Academies of Science, Washington, D.C.
(3) Guest workers in the High-Skills U.S. Labor Market: An analysis of supply, employment, and wage trends. Hal Salzman, Daniel Kuehn, and B. Lindsay Lowell. April 24, 2013 EPE Briefing Paper # 359, Economic Policy Institute. (1) Federal Support of Research and Development. Washington (DC): National Academies Press (US); 1995. (10) STEMtech Conference Program, http://www.league.org/2014stemtech/sessions.cfmNovember 9-12, 2014. http://www.league.org/2014stemtech/sessions.cfm. STEM Page organized by Kathy Barker and Seth Kershner. Kathy Barker is an author, counter-recruitment activist and educator based in Seattle Washington. Seth Kershner is a freelance writer and researcher based in Western Massachusetts.